Tis the season for attending and hosting holiday parties! This month I wanted to come up with a recipe that could be useful to both serve and eat at a party. I thought about making a dessert, perhaps even something with peppermint despite the fact that I don't care for anything with mint flavoring, but I decided that an appetizer may be the road less traveled as there are so many desserts being shared this time of year. This recipe for caramelized onion and goat cheese bread caught my eye because it seemed like it would not only be tasty, but also easy to eat. This appetizer is both savory and sweet. The goat cheese adds a bit of tang, while the caramelized onions and honey balance out the more savory flavors in the bread. And right at the end you get a nice crunchy texture with the toasted pecans and the edges of the bread. One word of caution, this recipe tastes the best when fresh out of the oven and might not travel well. If you're bringing this dish to a party, you can make everything ahead of time, wait to put it in the oven until you've arrived at your destination and then bake it and add the honey and pecan toppings to it when you're ready to serve. Providing there's an oven at your destination of course. 1. Place pecans in a single layer on a baking sheet. 2. Bake at 350º for 10 to 12 minutes or until lightly toasted. 3. Melt butter in a 10-inch skillet over medium high heat. Stir in onion and sugar. Cook, stirring often, 20-25 minutes or until onions are carmel colored. Add garlic, cook 2 more minutes. Remove from heat and let stand 30 mins. 4. Process onion mixture, goat cheese, salt and pepper in a blender or food processor 30 to 45 seconds or until ingredients are well blended and smooth. Spread mixture evenly onto cut sides of bread. Place on a baking sheet. 5. Bake at 375º for 15 minutes or until thoroughly heated and edges are lightly browned. Cut into 1-inch slices. 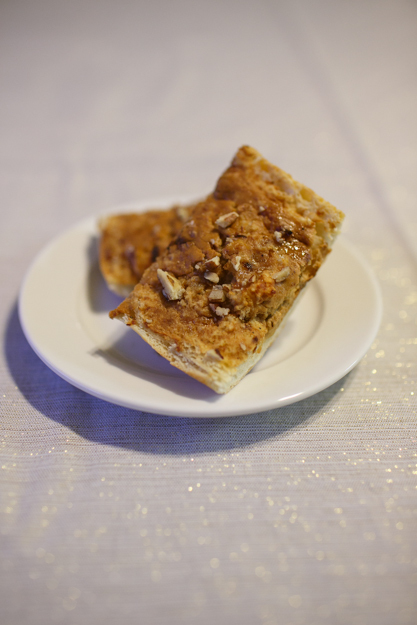 Drizzle evenly with honey and sprinkle with toasted pecans.